I heard about this "toy library" theory where parents keep toys to a minimum by rotating what's on display and keeping the rest hidden. It's easier said than done. I've been fixing a toy closet for nine months now. Back in January we had Ladybug Girl's closet made over to encourage more independence and confidence. Maybe that was over-reaching but these closets had ambition! 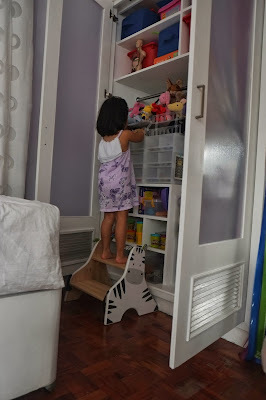 The other ambition was that hopefully the second closet will be for her sibling someday. If you build it, it will come. The one on the right is pretty successful. It's her clothes and linens closet. Ironically she hadn't shown much interest picking her own clothes. Which is fine because I live out my stylish wardrobe fantasies through her while my body and I are not on speaking terms. But she does fetch her nightwear for bed thanks to the low shelves. 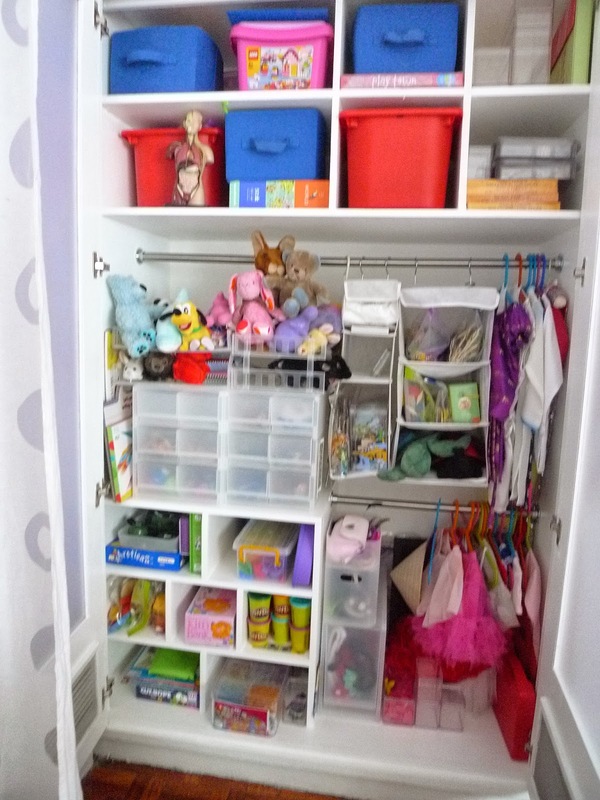 The closet on the left is meant to be the toy library. Believe me this doesn't look like progress but it is. 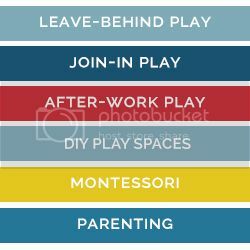 The goal is to keep all toys and leave-behind activity materials in one place. Except for her play kitchen space in the family area, she would know where all her things are. 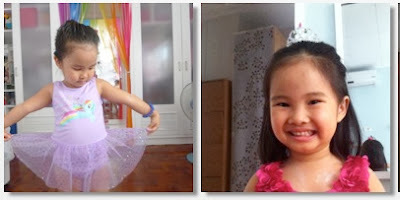 She dresses up for ballet "shows" (left) and sometimes wears a crown to school (right). Our very own toy store! I also put the newer toys and gifts she received for her birthday here. Here she is reaching for the Orbeez toy box. It looks manageable here but I still wish this would be half its size. She does use the toys though. 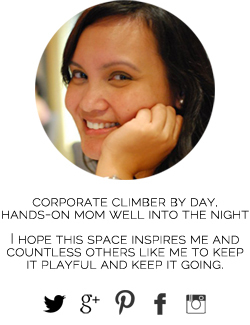 One time I checked in on her during the night and caught her in the darkened room, holding a flashlight and reaching for a toy "to cuddle for sleep". Toys I'm saving for future use and her Strawberry Shortcake collection for when she plays with her bed playscape. This was meant to be my storage for rotating repeat activities I would leave-behind for Ladybug Girl everyday. So until I finish up that pile, those organizers aren't really being useful as a self-limiter to our toys and supplies. But every single time I work to clear the pile, I get more ideas that I save up for when I have more time (I never do). I'm getting to my breakpoint where I can't stand the mess and I'll just throw everything out. That may not be a bad idea. Overall it's still great. I wish I had gotten started on it earlier when she turned one and all the toy store stuff started pouring in. But since that Strawberry Shortcake Sale lesson, we keep a one-in-one-out policy. It's also "saving the planet from trash" so she actually says she has too much toys. It helps when she really wants something, I ask what she can give away. I love it when she yells "Mommy! I found the walkie talkie!" or another toy that got buried in memory and the old mess. Some toys still multiply despite the toy library. Her father just can't resist Happy Meal toys and the occasional "guess what I have for you?" surprise. But by this time I can tell which toys make it to a semi-permanent place in her shelves. So our toy closet is not perfect, but it's a good start! 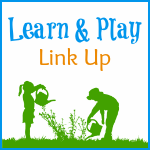 See a gallery of our other play spaces here. Where can I find the small toy drawers at? Hi there. I found these at Muji. I hope you have that where you live! LOL the old, " they have too much we'll limit it and they'll appreciate it more," theory. We do use it in preschool, by rotating things in and out, but I never found that it really worked in a home. I wanted my child to be able to access her piano if she was feeling musical, not wait till it came back in the rotation. And art supplies were always readily available in our home. But one thing I did do was go through their toys every fall, and eliminated the ones that were broken or never played with. They were always allowed an opinion, but when push came to shove they gave up the things that they didn't play with to make room for Christmas gifts. 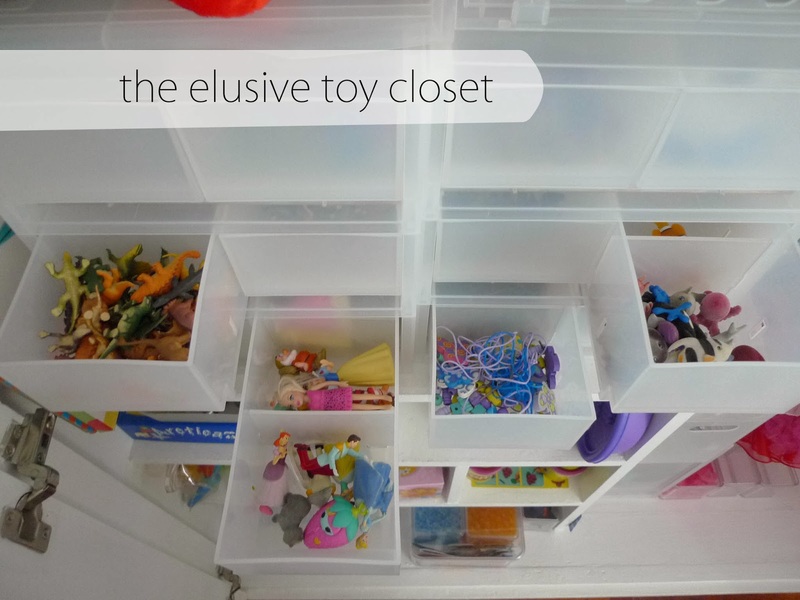 Another issue I had with the toy rotation in the home was that I found it too controlling, it takes away choice and creativity. And surprises. Hi mumsy, thanks for wandering over here. Liked reading your point of view. Same here on the art supplies and musical stuff which are forever out on the shelves! I hope by having this toy closet she still has easy access. I need to solve a few things that don't allow that. Admittedly I don't purge regularly. Thanks for wandering over here! Well, it looks pretty organized. Keeping her toys in their place and knowing where to find what she wants to play with at a particular time should be easier. The bins look sturdy and should last quite a long time with proper care. 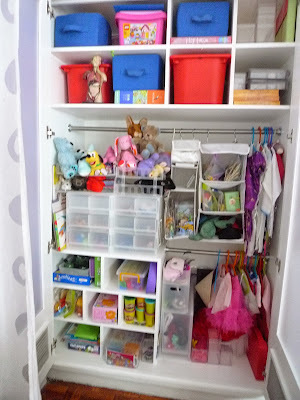 I love the way you have organized toys of your kid. actually, your kid will be very proud of you, You love your children and that is so happy. 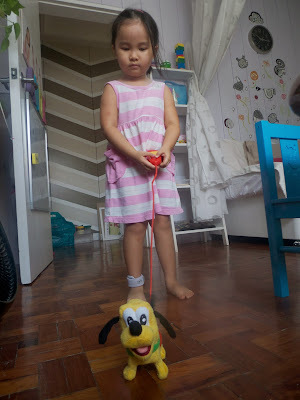 DIY toys for KID is very safe and creative. Thanks a lot for sharing. Keeping her toys in their place and knowing where to find what she wants to play with at a particular time should be easier.Thanks a lot for sharing.